Welcome to Experian Insights. Here you can view short videos that will introduce you to Experian and the many ways we use data and insights to help consumers and businesses. 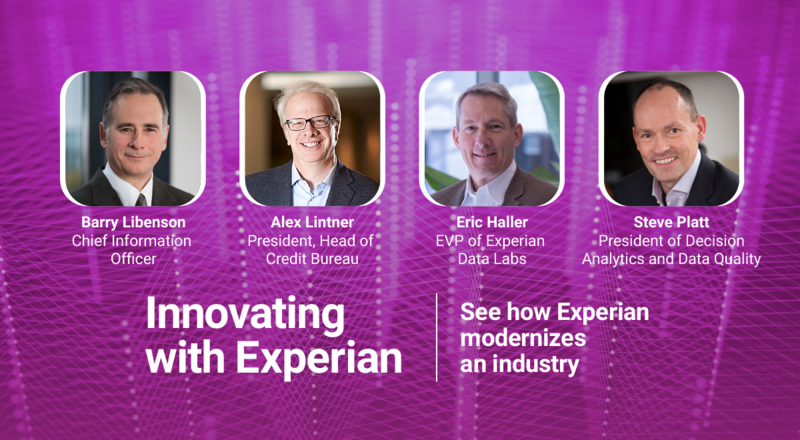 Experian Insights give a close-up look at Experian’s business, how we manage and analyze Big Data, valuable advice for consumers on how to manage credit and the latest business trends in a variety of industry segments. We hope you find these videos insightful and helpful, and we welcome you to join in the conversation about the topics with your comments and posts. Craig Boundy, CEO of Experian North America, discusses how big data is good for our economy, good for consumers and good for society. Dan Johnson, Experian’s Executive Vice President of Healthcare Strategy, discusses how big data can help the health care industry. Experian Data Breach Resolution discuss the importance of protecting patient records, and how data plays a role. Michele Raneri, Experian’s Vice President of Analytics, provides insight on the current state of student lending and talks about what this increasing debt means for students and the economy as a whole. Dr. Shanji Xiong, Chief Scientist for Experian’s Global DataLabs, shares his fascinating journey from growing up in Communist China to his current status as one of the world’s premiere data scientists. Experian employees are volunteering to help people better manage their credit. In this segment, we are introduced to the Experian Ambassadors program. The exchange of goods and services for business large and small is what our society is built on. Hiq Lee, president of Experian’s Business Information Services explains how big data is actually a driving force in commerce. Brad Smith, Experian Automotive’s director of market statistics, explores the impact that length of vehicle ownership has on the likelihood a consumer returns to market to purchase a vehicle of the same brand. Automotive Analytics: Why are Green Car Sales Flat? Melinda Zabritski, Experian’s senior director of automotive finance, discusses findings from a recent analysis exploring trends in the alternative-powered vehicle market, and explains what the data means for the industry. Peter Bolin, Experian’s director of consulting and analytics, examines findings from an analysis that compares the credit attributes and industry preferences of male- and female-owned businesses, and discusses how those characteristics can impact a small business owner’s ability to receive funding. Brad Smith, Experian Automotive’s director of market statistics, examines findings from an analysis that shows consumers in major metropolitan areas tend to lease vehicles, while consumers in smaller markets tend to buy used. Your credit report is one of your most important financial tools. It serves as your financial reference and helps you get approved for credit. Rod Griffin discusses the tools and resources that can help you proactively manage, build and improve your credit. Talk to any company about fraud and they’ll tell you the challenge is how to fight the criminals without angering – or worse, losing – valued customers. Experian’s Charles Chung and specialists from 41st Parameter discuss the issue in this important segment. entities make a formidable foil against fraud criminals. Frank Abignale, one of the world’s most respected authorities on the subject of forgery, discusses how data analytics can help organizations deal with today’s cybercrime. Abignale’s life story provided the inspiration for the feature film Catch Me If You Can.